This recipe will make 20 lip balm tubes. You can always reduce the batch size by cutting the recipe in half. Measure butters and essential oils and place in glass jar. Once boiling, add glass jar to center of saucepan. Once wax is melted, remove from heat and let sit 3 minutes then add essential oils. Tip: If you want a harder lip balm, add an additional 15 grams of beeswax. For an even softer lip balm, add an additional 15 grams of coconut oil. This lip balm makes a great gift and can easily be customised. Change the colour or the scent by using a variety of mineral makeup and essential oils. 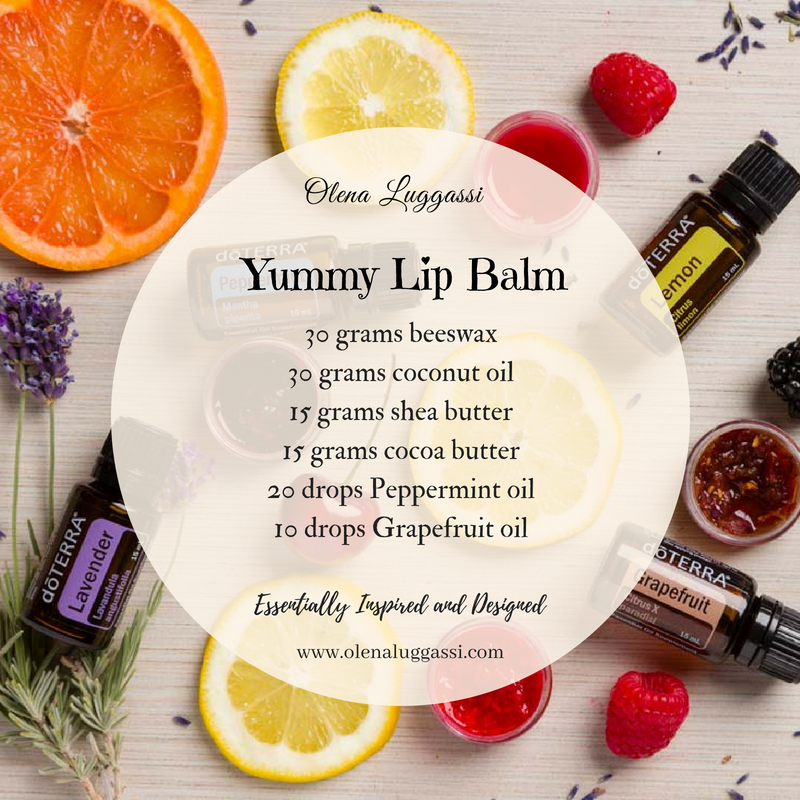 If you don't have time to make your own lip balm then try one of the doTERRA SPA Lip Balm flavours. This Whipped Cocoa Body Butter is extremely nourishing and will leave your skin feeling soft! I love this nourishing cocoa body butter and use it every time after I have my bath. This Body Butter is great for babies or anyone with sensitive skin. You can add various essential oils to suit your taste and purpose. 5. Use a hand mixer to whip for 10 minutes until fluffy. Add essential oils and whip for another minute. 6. Store in a glass jar with a lid. My favourite essential oils to use are Lavender, Grapefruit, Rose, Ylang Ylang, Sandalwood, Geranium, Frankincense, Wild Orange and Cinnamon Bark. Your beautiful feet deserve it. I love using Citrus Bliss blend when I care about my feet. The blend is a power house of energy and freshness- Wild Orange Peel, Lemon Peel, Grapefruit Peel, Mandarin Peel, Bergamot Peel, Tangerine Peel, Clementine Peel essential oils and Vanilla Bean Absolute. ​Love the skin you're in! ​We all like taking baths for different reasons. Even though a nice warm bath can be exactly what you need to make your day better, there are a couple extra ingredients that can make your soak in the tub even more beneficial. Our Bath Salt with Wild Orange Essential Oil is super easy to make. You will feel refreshed, energised and happy, because Wild Orange is very uplifting to the mind and body. Hand & Body Scrubs are beautiful home treatments that deliver skin-loving benefits. The super moisturising sugar scrub will help exfoliate, soften and refresh your skin. One way to keep your skin looking healthy is to exfoliate regularly. This sugar scrub is one of my fav DIY recipes, and it is very easy to make. The sugar scrub makes a great gift idea all year round! To use the scrub simply put a small amount in your hand and scrub all over your body, hands and feet. Rinse with warm water.